In online course development the production of narrated lectures that serve as course content if common. Often faculty turn to presentation software, such as PowerPoint, as the foundation of their presentation. Using PowerPoint for narrated lectures means faculty must consider developing presentation slides that are accessible, attractive, and visually focused. This is not an easy task without some guidance in these areas of presentation design. This is where PowerPoint template use comes in handy. The Ecampus design team at Oregon State University has produced a series of PowerPoint templates to assist faculty produce effective, accessible, and visually attractive presentations. The templates are available via the PowerPoint Guidelines and Templates website that provide not just the templates but also best practices in template use. On the site Ecampus faculty can find templates developed with seven different designs. Each has an application for a given area of the university or function. To illustrate this point I have placed an image of a template title slide for the College of Forestry design. 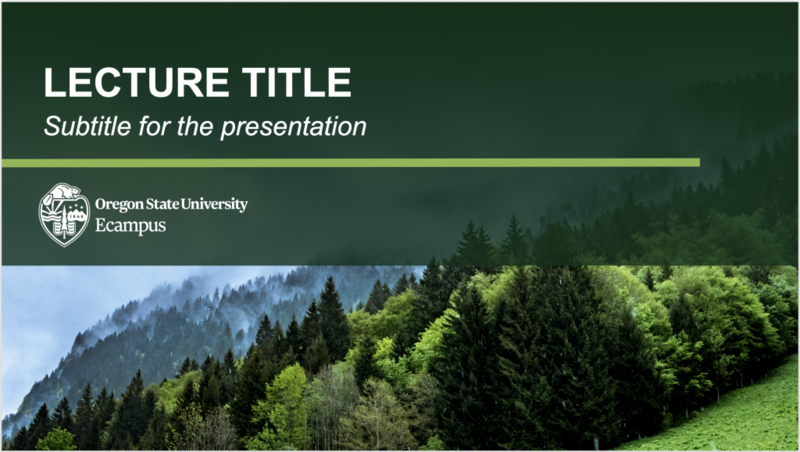 College of Forestry PowerPoint template title slide. Using this template faculty can edit the text and background image to create their own custom PowerPoint design. Below is the entire College of Forestry design series. In it you can see that there is good variety of slide types and design layouts. The slide series from the College of Forestry PowerPoint template. Produced by Ecampus. Adapting the template for other course uses if fairly straight forward. Simply collect the images you wish to insert into the template and add the pertinent text. Below is an example of an adapted series of slides turning what looks like a forestry presentation into an organic agriculture presentations. 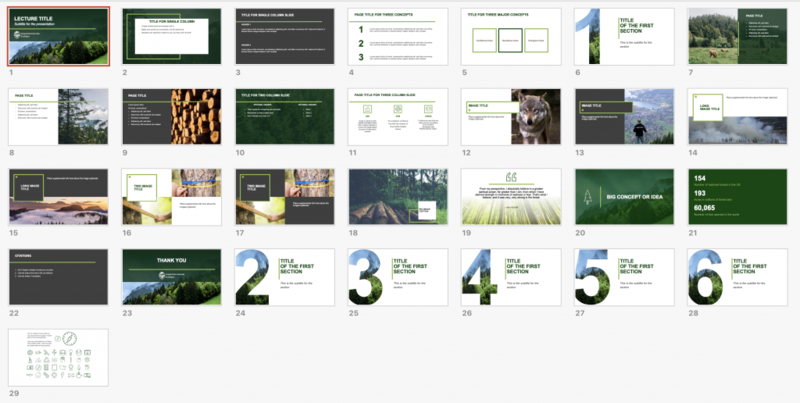 New organic agriculture slides created from College of Foresty template. Images provided by Unsplash. With seven different templates to choose from faculty have a wide range of design options for narrated lectures using PowerPoint. These designs are also accessible and are visually consistent. Slide types vary to allow faculty to focus presentation attention on the subject at hand. This can save faculty time and effort in narrated lecture production. If you are an Ecampus faculty and you would like to learn how to edit and utilize this templates resource, ask your instructional designer. The Ecampus PowerPoint Guidelines and Templates website is another example of how faculty and students benefit from the dedicated team of designers and multimedia producers at the Oregon State University Ecampus.